Open reduction for delayed presentation of pediatric thumb MCP dislocations. Case Report | Volume 5 | Issue 3 | JOCR July-Sep 2015 | Page 5-8 | Nicola Blucher, Shyamsundar Srinivasan, Alfie Bass. DOI: 10.13107/jocr.2250-0685.293. 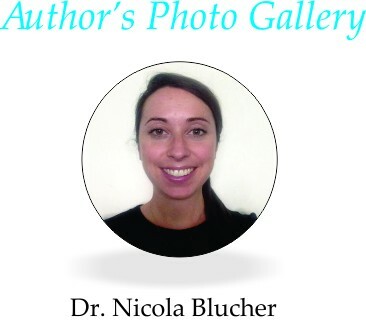 Authors: Nicola Blucher, Shyamsundar, Alfie Bass. Department of Orthopaedics, Alder Hey Children’s Hospital, Liverpool, UK. Alder Hey Children’s Hospital, Eaton Road Liverpool, L12 2AP UK. Introduction: Dislocation of the metacarpophalangeal joint (MCPJ) of the thumb is rare in children and delayed presentation of this injury is even more uncommon in the literature. We report two cases, both children, who presented to fracture clinic with a dislocated thumb over one week after initial injury. In each case closed reduction was attempted but failed and open reduction was necessary. Case Report: Case Presentation 1: A four year-old right-hand dominant girl sustained a hyper-extension injury to her right thumb while on holiday abroad. She was told she has ‘sprained’ her thumb. On review in fracture clinic 10 days later, the MCPJ of her thumb remained swollen and bruised. Radiographs showed a dorsally dislocated MCPJ of the right thumb. Case Presentation 2: A four-year old right-hand dominant boy presented to fracture clinic after being referred from A&E with a left ‘thumb injury’ – his thumb had accidentally been jammed in a door one week previously. Radiographs were reviewed and repeated, confirming a MCPJ dislocation. Conclusion: Dislocation of the MCPJ of the thumb is extremely uncommon in children and therefore the diagnosis can be easily missed. Two unusual cases of dislocated MCPJ of the thumb in children that presented late because both radiological and clinical features had been missed are described. Closed reduction should always be attempted first but it should be recognised that conversion to an open reduction may be needed, particularly if there is a delay in presentation. There are various surgical options for open reduction including volar and dorsal approaches and arthroscopic procedures. The optimal method is controversial. We have explained a successful open reduction using a dorsal approach. In both cases the volar plate was found to be interposed within the joint blocking reduction. At follow up the patients had regained a full range of movement, normal power and grip strength. Keywords: Paediatric Orthopaedics, Metacarpophalangeal joint, Dislocation, Open reduction. Isolated thumb metacarpophalangeal joint dislocation in the paediatric age group is a very rare injury [1,2,3]. It usually presents acutely and is often treated conservatively with excellent outcomes. Open reduction is only necessary after failed or improper closed reduction . We report two cases, both children, who presented to fracture clinic with a dislocated thumb over one week after initial injury. In each case closed reduction was attempted but failed and open reduction was necessary. 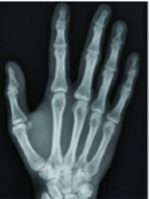 A four year-old right-hand dominant girl presented to fracture clinic with a painful right thumb. She had initially injured it 10 days previously while on holiday in Spain. A rugby ball had been accidentally kicked at her and she sustained a hyper-extension injury to her right thumb. She was taken to a local hospital where she was assessed and relevant radiographs taken. She was told she had ‘sprained’ her thumb and was prescribed analgesia and advised to be reviewed at a local clinic on her return to the UK. On review in our fracture clinic, the MCPJ of her right thumb was swollen and bruised on examination. The metacarpal head of her thumb was prominent dorsally compared with the left and she was in substantial pain on any attempt to move her thumb. Radiographs were repeated and showed a dorsally dislocated MCPJ of the right thumb (Fig 1A and 1B). Due to her age she would not have tolerated a digital ring block and attempted closed reduction in clinic. Therefore she was admitted for manipulation under anaesthesia +/- open reduction. In theatre closed reduction was attempted and although the joint could be relocated it was unstable and was re-dislocating immediately. Open reduction was undertaken. A dorsal approach over the MCPJ was made through the skin and subcutaneous tissues using a longitudinal incision over the centre of the joint down onto the extensor apparatus (Fig 2A and 2B). The extensor pollicis longus tendon was dissected and retracted medially. A transverse incision was made in the middle of the joint capsule to expose the joint. The volar plate was found interposed within the joint, preventing successful reduction. This was released from the joint and the MCPJ reduced successfully. Both the radial and ulnar collateral ligaments were intact.The thumb was stable on further passive manipulation, which was confirmed with image intensifier .The joint capsule was closed with sutures, as was the incision. A plaster of Paris thumb spica was applied for 4 weeks. Radiographs confirmed that the joint remained reduced out of plaster (Fig 3A and 3B). After this the patient was advised to start actively moving the joint and by eight weeks post-op a good range of movement had been regained and she was discharged at 12 weeks. A four-year old right-hand dominant boy presented to fracture clinic after being referred from A&E with a ‘thumb injury’. He had presented with a painful left thumb after it had inadvertently got jammed in a door when he had been playing at home. In the emergency department he had radiographs (Figs 4A and 4B) and was reassured that there was no fracture and follow up was arranged in fracture clinic one week later. The patient continued to report that his thumb was painful and on examination it was swollen and extremely tender. The radiographs were reviewed and repeated, showing a MCPJ dislocation. He was taken to theatre that evening for attempted reduction under a general anaesthetic. Closed reduction was unsuccessful and it was converted to an open procedure. As with Case 1, a dorsal approach over the MCPJ was made down through the joint capsule. The volar plate was released from the joint and a successful and stable reduction was achieved. As in case 1, both the radial and ulnar collateral ligaments were intact. Reduction was confirmed with image intensifier. After closure of the joint capsule and wound a plaster of Paris thumb spica was applied. Radiographs taken at one week postoperatively showed satisfactory position of the joint in plaster (Fig 5). At follow up one month postoperatively the plaster was removed. The range of motion, power, stability and sensation was normal and x-rays satisfactory. Final follow up was at three months, he had a normal range of movement and no further dislocations. Isolated thumb metacarpophalangeal joint dislocation in the paediatric age group is a very rare injury [1,2,3,5], with dorsal dislocations being more common than volar dislocations [6,7]. Dorsal dislocation of the MCPJ of the thumb usually results from hyperextension, either from injury or a fall on an outstretched hand . The diagnosis should be made both clinically and using radiographic evidence. Dislocations are rare in children due to their unique anatomy; the bones can be weaker than the ligaments and soft tissues. As a result of this, children are more vulnerable to sustaining Salter Harris fractures through the epiphyseal growth plate rather than joint dislocations. The earliest record in the literature of this injury in children from is from 1920 . Usually these injuries present acutely and are often treated conservatively with excellent outcomes. Previous reports have emphasised the importance of achieving a stable reduction acutely . Closed reduction should be attempted initially and only in cases of delayed treatment or instability after reduction should more invasive procedures be performed . In a Japanese study in 1998  nine adult patients with a dorsal dislocation MCPJ of the thumb were reviewed. Eight of the nine patients were seen within four days of injury and treated successfully by closed manipulation. Only one patient, treated seven days after the injury, required open reduction. McLaughlin  explained that for a successful closed reduction the joint should be hyper-extended, and the base of the proximal phalanx be pushed over the metacarpal head. If this is not done properly a simple dislocation can be made into a complex one. The predominant structure preventing closed reduction, as in our case studies, is the volar plate [7,10,12]. Other soft tissue structures including flexor pollicis longus, sesamoid bones and the capsule have been reported to block reduction of dorsally dislocated thumbs [6,12] – all resulting in a complex dislocation. In a study by Takami et al  it was hypothesised that when the volar plate interposes the joint radiographs show an increased distance between the palmar edge of the bases of the proximal phalanx and the metacarpal head, therefore failed closed reduction could be predicted. Ip et al also postulated this . If an open procedure is necessary then there are various surgical options including volar and dorsal approaches and the optimal treatment option is still controversial. Individual surgical experience and concomitant injuries may affect preference. There is a higher risk of neurovascular injury with a volar approach compared to a dorsal approach due to the anatomy and location of neurovascular bundles. However, when using a volar approach the volar plate can be directly visualised and repaired easily . Arthroscopic reduction has been used in metacarpophalangeal injuries  and more recently a percutaneous technique has been documented . Both of these minimally invasive methods reduce the risks associated with the open volar approach but they have only been shown in the adult population and require a very specialised skill set. It is important to assess collateral ligament stability after any reduction, as it is commonly injured in dorsal dislocations . If the joint does remain unstable after open reduction then surgical stabilisation of the capsuloligamentous complex may also be necessary. With regards to post-operative advice, the limited literature available suggests that early mobilisation is beneficial to improved function [11,13]. 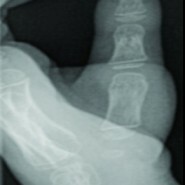 Dislocation of the MCPJ of the thumb is uncommon in children and therefore the diagnosis can be easily missed. We have described two cases that unusually presented late because radiographic features had been missed and were therefore treated at least one week after initial injury. Closed reduction should always be attempted first but it should be recognised that conversion to an open reduction is likely to be needed when diagnosis has been delayed. As in these case studies, soft tissues, including the volar plate can prevent dislocations being fully reduced in closed manipulations. There are different surgical approaches that can be used all of which have potential complications and limitations . We have shown excellent post-operative results following dorsal approach to the MCPJ. This option enables the surgeon to enter the joint and remove the volar plate or any other soft tissues preventing reduction without compromising the radial and ulna digital neurovascular bundles. Both patients had a full range of movements and regained full function within 12 weeks. Thumb MCPJ dislocation is well recognised in adults but is rare in children. It is imperative that radiological features are not missed and the diagnosis delayed. For children, as in adults, if closed reduction fails more invasive procedures should be performed. 1. Nusem I, Lokeic F, Weintroub S, Ezra E. Isolated dislocation of the thumb carpometacarpal joint in a child. J Paediatric Orthop B 2001; 10(2):158-60. 2. Hocker K. Isolated traumatic dislocation of the thumb saddle joint. Handchir Mikrochir Plast Chir 1997; 29(2):88-7. 3. Sulko J. Metacarpophalangeal joint dislocation of the thumb in children. Chir Narzadow Ruchu Ortop Pol. 2004; 69(5):331-3. 4. Ip K, Wong L, Yu S. Dorsal dislocation of the metacarpophalangeal joint of the thumb: a case report. J Orthop Surg 2008; 16(1):124-6. 5. Bosmans B, Verhofstad M, Gosens T. Traumatic thumb carpometacarpal joint dislocations. J Hand Surg Am 2008; 33(3):438-41. 6. Mata G, Overjo H, Grande M. Volar dislocation of the first metacarpophalangeal joint a case report and review of the literature. Acta Orthop Bel 1991; 57(3):323-8. 7. Maheshwari, Sharma H, Duncan R. Metacarpophalangeal joint dislocation of the thumb in children. J Bone Joint Surg 2007; 89-B:227-9. 8. Whitchuch Howell B. Dislocation of the thumb in a child, aged 9 months. Proc R Soc Med 1920; 13(Sect Study Dis Child):131. 9. McLaughlin M, Abouzahr M. Acute dislocation of the trapeziometacarpal joint in a child. J Hand Surg Am 1998; 23(6):1097-9. 10. Takami H, Takahashi S, Ando M. Complete dorsal dislocation of the metacarpophalangeal joint of the thumb. Arch Orthop Trauma Surg 1998; 118(1-2):21-24. 11. McLaughlin H. Complex ‘locked’ dislocation of the metacarpophalangeal joints. J Trauma 1965; 5:683-8. 12. Gerard F, Pem R, Garbuio P, Obert L, Tropet Y. Irreducible dorsal dislocation of the interphalangeal joint of the thumb due to the palmar plate. A Case report. Ann Chir Main Memb Super 1998; 17(1):63-7. 13. Durakbassa O, Guneri B. The volar surgical approach in complex dorsal metacarpophalangeal dislocations. Injury 2009; 40(6):657-9. 14. Ryu J, Fagan R. Arthroscopic treatment of acute complete thumb metacarpophalangeal ulnar collateral ligament tears. J Hand Surg Am 1995; 20: 1037-1042. 15. Sodha S, Breslow G, Chang B. Percutaneous technique for reduction of complex metacarpophalangeal dislocation. Ann Plast Surg 2004; 52:562-6. 16. Stener B. Hyperextension injuries to the metacarpophalangeal joint of the thumb: rupture of ligaments, fracture of sesamoid bones, rupture of flexor pollicis brevis. An anatomical and clinical study. Acta Chir Scand 1963; 125:275-93.